More pieces are coming together as yet another development on the sealed indictment case unfolds. And wouldn't you have it, this development comes as the fulfillment of further Q predictions. The famed D5 quote from several past Q Anon posts on 8Chan seemed to forecast some major development on the date of December the 5th, or so many citizens assumed. However, as we have observed, Q drops do not state exact facts. Instead, the various posts from Q only appear to drop small hints and from those hints, various online personalities make inferences as to what these posts may mean in our present societal situation. The mistake that many people seem to make is to assume that the inferences from citizens about Q posts are actually factual and that any conclusions drawn by Q commentators directly represent the intentions of the Q group. Of course, this is not the case. If Q Anon is, indeed, the individual/group we believe them to be, this means that they are hinting at matters of national security. This means that there are no direct statements made about classified situations until those situations are resolved and become public knowledge. With this in mind, there is no reason for us to be excessively disappointed when the assumptions and predictions of Q commentators do not come to pass in the exact way they are expected to. We may also note that the compromised corporate media, as well as alleged anti-Q shills typically ridicule the 8Chan poster simply because the predictions of commentators do not come to pass. However, as we may have realized, these attempts at criticism are fallacious, as they are based upon flawed logic and the concept of guilt by association. Naturally, until we see actual events transpire and are able to thoroughly analyze the true correlations these events have with Q posts, it may be best to keep an open mind. In the case of the D5 quote, it appears that this date was indeed December 5. No, there did not appear to be an insanely enormous, earth-moving occurrence on that date—unless you consider the funeral of an alleged mass murderer and war criminal. However, it was never stated by Q that there would be any such event on the 5th. Instead, it appears that December 5th was intended to be a roundabout deadline of some kind. After this apparent deadline, we saw a rapid increase of media statements and investigations which many of us never believed we would see. As we witness the beginning of the downfall of the Clinton regime, some may feel as though they are watching the seas part and the mountains move. Yet even as unlikely as we may have believed this downfall may have been, it is not entirely surprising to see the (alleged) crimes of the guilty catch up with them. December 4th brought us the revelation and fulfillment of a Q prediction which many did not even realize was a prediction. 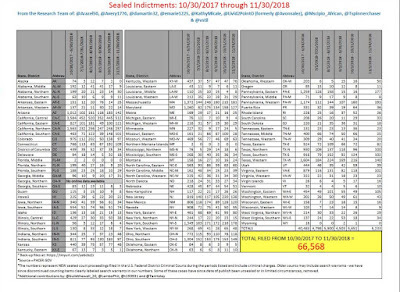 Just prior to that date, we saw the unsealing of a major aspect of the sealed indictment case from the District Court of Washington, D.C. That occurred on October 2nd. We then witnessed yet even further reinforcements deployed to Guantanamo Bay Naval Base on December 2nd. 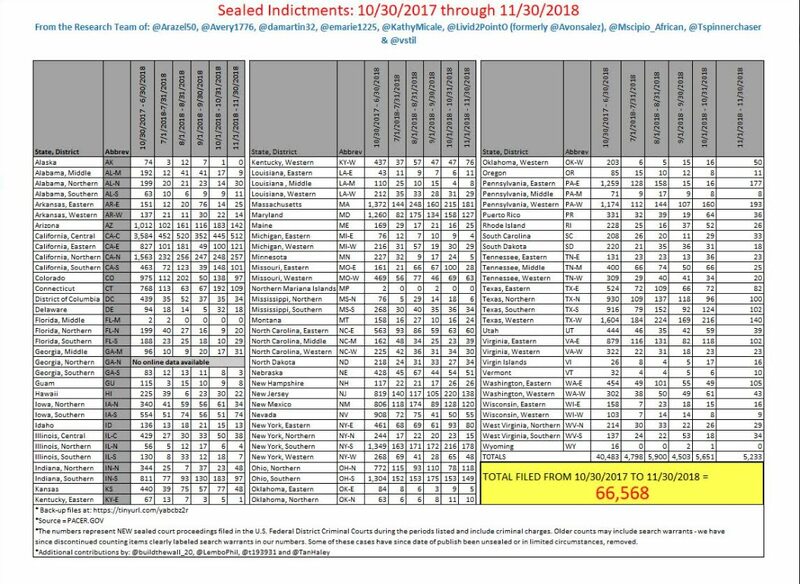 Now, only two days later, we have yet another of the 66,000 plus sealed indictments unsealed and made available to the public. In these ways, it seems as though the untouchable Clinton clan are facing the brunt of reality in a way they are not used to. No longer does it appear they have the protection of the entire American media establishment to euphemize and even praise their crookery. Instead, it appears as though even formerly corrupt aspects of the Cabal establishment are turning against them. If the latest intel regarding the Clintons is accurate, and the passing of George Bush Sr. opened the door to the appropriate investigation and prosecution of the Clintons, our December and the coming months could be very interesting indeed. MANHATTAN (CN) – Three years after the leak of the Panama Papers exposed a worldwide network of tax-avoiding shell companies, federal prosecutors brought charges Tuesday against four men tied to the law firm Mossack Fonseca. Obtained by the German newspaper Suddeutsche Zeitung from an anonymous source, the 2015 data dump is considered history’s biggest leak, laying bare in 11.5 million files how people around the world, including world leaders of the U.K., Iceland and Russia, shuffled their assets into tax havens. The nonprofit International Consortium of Investigative Journalists partnered with media companies in more than 70 countries to pick apart the once confidential documents, embarrassing among others the inner circles of Russian President Vladimir Putin and former British Prime Minister David Cameron. In a tangled 67-page indictment, U.S. prosecutors charged four men tied to the firm. The ones captured by authorities are Dirk Brauer, a 54-year-old German investment advisor for Mossfon Asset Management; Richard Gaffey, a 74-year-old U.S. accountant; and Harald Joachim von der Goltz, an 81-year-old German-born client. Mossack Fonseca attorney Ramses Owens, a 50-year-old from Panama, remains at large. U.S. Attorney Geoffrey Berman said Tuesday that all are under indictment in New York. Untangling the cases of five Mossack Fonseca clients – one named and four unnamed – court papers show how the firm created labyrinthine networks of shell companies to keep their clients’ assets from the tax authorities. “Owens and Brauer created, marketed, sold, and serviced sham foundations and shell companies formed under the laws of countries such as Panama, Hong Kong, and the British Virgin Islands to conceal, from the IRS and others, the ownership by U.S. taxpayers of accounts established at overseas banks, as well as the income generated in those accounts,” the 67-page indictment states. In multiple cases, prosecutors say, Mossack Fonseca scrambled to pick up the pieces after the Panama Papers hit the public sphere. 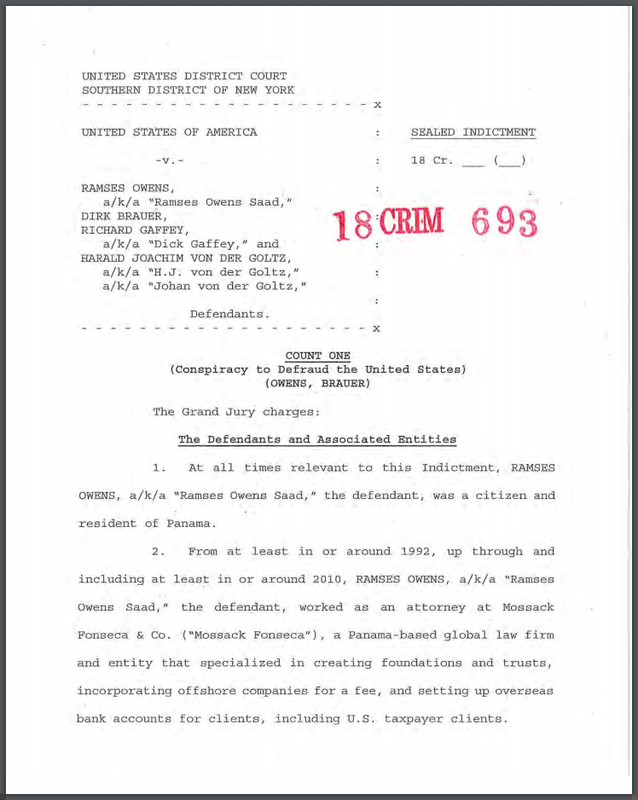 One example from the indictment is the case of von der Goltz, a German national who grew up in Guatemala who has lived in the United States since 1984. 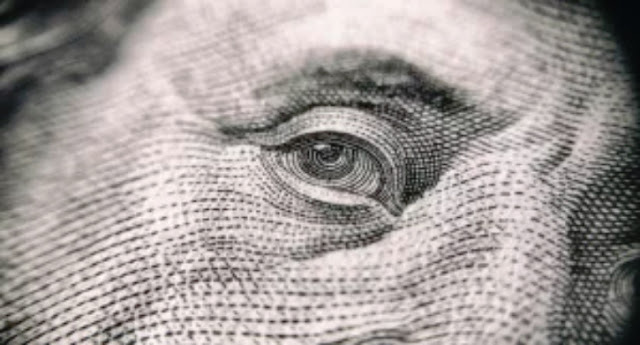 Prosecutors claim he dodged U.S. taxes with a series of shell companies to mask more than $30 million in assets placed in Revack Holdings Foundation via a shell company EMJO Investments Limited. Von Der Goltz is the founder and manager of the foundation, but prosecutors said he hid that fact through a complex corporate structure of other Revack entities listing his 102-year-old mother as the beneficial owner. “She is a Guatemalan citizen and resident, and – unlike von der Goltz – she is not a U.S. taxpayer,” the indictment states, referring to the elderly mother. After the exposure of the Panama Papers in May 2016, prosecutors said, a law firm contacted the Department of Justice on von der Goltz’s behalf to “correct” statements made about him to the press. “The statement of facts further falsely represented, in substance and in part, that von der Goltz was not the beneficial owner of EMJO, that he had ‘signature only’ authority over the Swiss Bank EMJO Account, and that he had not used EMJO ‘to hide funds from the U.S. or other tax authorities,’” the indictment states. After the Panama Papers story broke a year earlier, prosecutors said, “Client-3” scrambled with Brauer to hide the $7.3 million in those assets still in Mossack Fonseca’s accounts that had been unmasked. 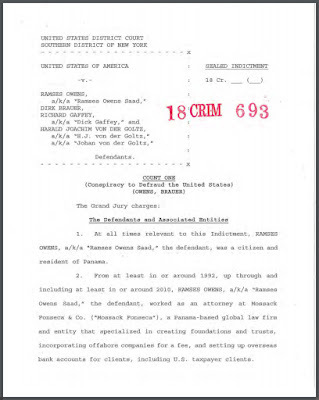 “Brauer suggested the creation of a new sham foundation that would hold new shell companies, which in turn would hold new bank accounts,” according to the indictment. In June 2017, prosecutors said that they “Client-3” and an undercover agent for a meeting with Bauer in Bermuda to talk about tax evasion – and a side project.